A vibrant lesson in the interaction between facades and surfaces Discover the uses and explore the possibilities of a nuanced world of colors and textures. Ten years ago, the designer Hella Jongerius began a research project for the Swiss furniture company, Vitra, to study the properties and possibilities of colors, textures, finishes, and materials This long-term project has resulted in the Vitra Colour & Material Library, which is dedicated to the establishment and further development of an intelligent system of colors, materials, and textiles that make it easy to create inspiring environments in offices, homes and public spaces. 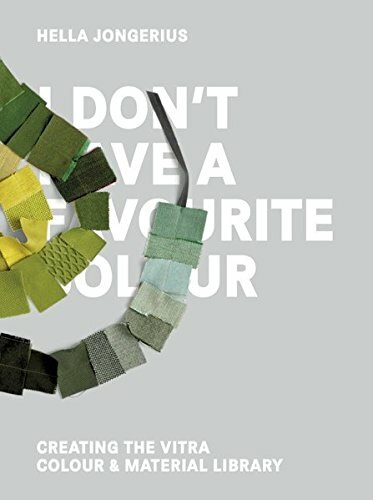 In the book I Don’t Have a Favourite Colour, Hella Jongerius describes her method of research and the application of its results to the Vitra product portfolio. Creating innovative products and concepts is VITRA’S essence. Developed in Switzerland and installed worldwide, they build inspirational spaces. Vitra believes in loyalty, durable products, sustainable growth, and the power of design. The Vitra Campus and Design Museum inspire visitors, inform the design process, and create a flourishing atmosphere. If you have any questions about this product by Gestalten, contact us by completing and submitting the form below. If you are looking for a specif part number, please include it with your message.